Heat shrink tubings include thin wall, medium wall and heavy wall adhesive lined types. 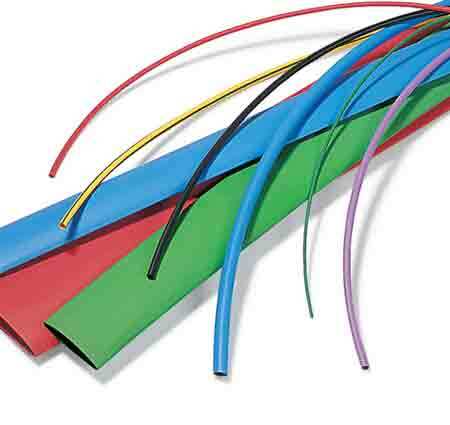 Typical heat shrink applications include electrical insulation, cable sheath repair, strain relief, waterproofing, identification by colour coding, corrosion and mechanical protection. T&D hold extensive stocks of standard heat shrink tubing, cable caps, cable breakouts and specialist materials including PTFE, Teflon, Viton, Zero-Halogen, Chemical Resistant and High Temperature heat shrink. T&D distribute Hellermann Tyton Helashrink heat shrink boots and mouded shapes for cable harnessing and backshell connector cable strain relief applications. Thorne & Derrick are the largest UK distributor of heat shrink tubings and sleevings including 3M, Panduit, Hellermann Tyton, DSG Canusa, Shrinktek, Raychem and Thomas & Betts heat shrink products. 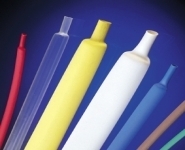 Stock lines include thin, medium and thick wall adhesive lined heat shrink sleeves and moulded shapes (heat shrink cable caps, cable breakouts and cable boots) - insulate, seal, protect with heat shrinkable tubing. Always select the heat shrink tube in such a manner that the diameter following full recovery (post-heating) is only slightly less than the object that it is intended to cover. This will allow for maximum heat shrink wall thickness and therefore optimum electrical insulation and protection. When applying a heat shrink tube, cut the tube to the length required (if not already precut), making sure that the cut has a straight edge. A poor or jagged cut may result in the heat shrink tubing to split during application. Slide the heat shrink over the application to be covered i.e. cables (low or high voltage), pipes, conduits, electrical equipment, wire harness etc. Metal objects with a large mass should be heated prior to application to avoid uneven shrinkage of the product, or areas of poor shrinkage (called “cold spotting”). Shrink the heat shrink onto the object to be covered, starting at one end using a heating appliance for this procedure, for example a heat gun. The optimal heat shrinking temperature is detailed in the product specification and is vital to assure a short shrinking period and even shrinkage of the product. Thinner wall heat shrink products will shrink faster than those with a heavier wall, and the object to be covered will be heat affected less during the process. Ensure even heat distribution in order to prevent overheating. Overheating of the heat shrink tube will cause bubbles, discolouration or even splitting of the tubing. Heat shrink with adhesive lining may have a discharge at the open end of the tubing - this is normal and creates an environmental water-proof heat shrink seal. After application, always allow the heat shrink to cool before bending or installing the final unit. Q: How do I shrink the tube? 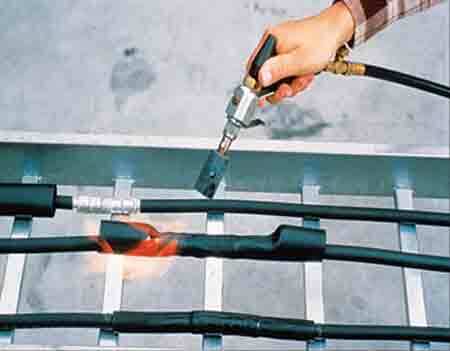 A: There are various ways to shrink tubing but the most common is with a hot air gun. Apply the heat evenly around the heat shrink tube working either from the middle out or from one end to the other. Q: How do I measure heat shrink tubing? A: Heat shrink tubing is always measured as an internal diameter - measure across the inside of the open end of the heat shrink tubing and ensure the tube is round and not flat.